Fire fighters demonstrating hazard abatement to media this afternoon. 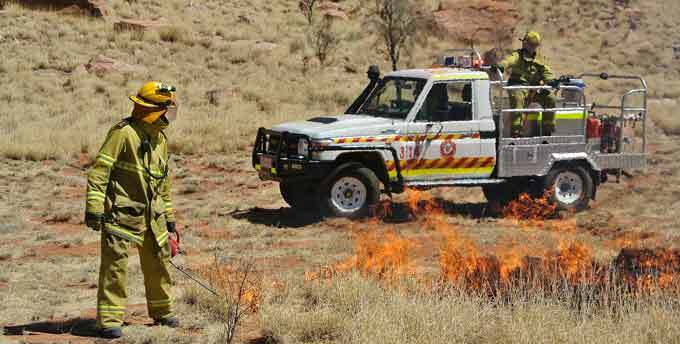 Fire authorities will be training unpaid volunteers to become arson investigators after last year 41% of the NT was burned, an area twice the size of Tasmania. It only gets as bad as this every 40 to 50 years. Up to 80% of the fires had been deliberately started, says District Fire Officer Southern Region Dave Letherby. Chief Fire Officer Steve Rothwell says four people in The Centre will be trained in a course starting in a fortnight’s time. They will “be able to investigate fires in their own area,” he says, and if they suspect foul play they will alert on-call police investigators. “Arsonists operate on a pattern,” says Mr Rothwell, and the new initiative “will break that pattern down”. He says it’s part of the national initiative to stop firebugs: if someone dies in a fire deliberately lit, the arsonist will now be tried for murder. Around the nation, some 30,000 fires a year are deliberately lit, at a cost to the community of $1.6b. Mr Letherby says the West Macs, where fire has already been raging in the past few weeks, are likely to have an “average season because that got burned fairly hard last year”.